This is a heat sink for high-power LD (Laser diode) modules. 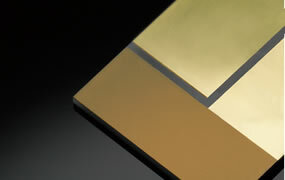 Three-layer composition achieves both high thermal conductivity and insulation quality. 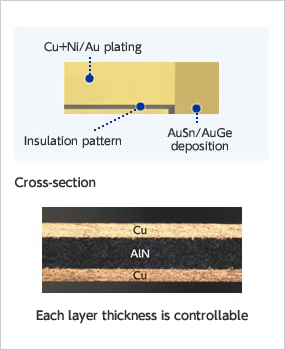 Control of Cu plating thickness makes the heat sink match with the LD, resulting in higher power and longer life of the LD module. Because pullback is not required on the critical edge area, it has a high degree of freedom in designing. Moreover, it can be applied to a variety of application by this freedom in design.